If you can't find a book here at Trinity, you can request it through I-Share, which allows you to borrow books from over 80 other academic libraries in Illinois. Since the requests are sent to libraries close to us and are fulfilled automatically, this is the fastest way for you to borrow books from other libraries. I-Share is for books and some other physical items. Journals and e-books cannot be borrowed through I-Share. You can request copies of articles/chapters and books not available in I-Share through WorldShare. 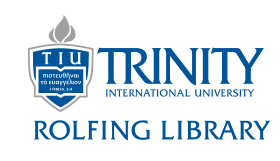 You can use your Trinity ID to visit and check out books at any of the member libraries. Always remember to check the catalog before you go to make sure an item is available. Number of times a item may be renewed 3 (except Faculty and Academic Employees) Faculty and Academic Employees (only) may renew items 6 times. Non-print items are not renewable.